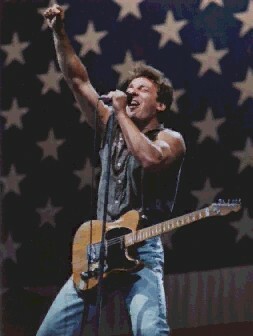 Bruce Frederick Joseph Springsteen was born on September 23rd, 1949 to Douglas and Adele in Freehold, New Jersey. The family later moved from their small house on Randolph Street to a larger one on Institute Street. Bruce bought a second-hand guitar in a pawn shop when he was thirteen, inspired by an Elvis Presley special he saw on television. Jailhouse Rock was the first record he ever bought. He taught himself to play the guitar, along with the piano and harmonica. While in high school, he played at local bars and clubs with his band, The Castiles. Later incarnations included the names Child, Steel Mill, Dr. Zoom and the Sonic Boom, and the Bruce Springsteen Band. In 1972, Springsteen signed with Columbia Records after auditioning for John Hammond in New York. Hammond held the distinction of being the one who signed Bob Dylan for Columbia. Bruce came out with his first album, "Greetings from Asbury Park N.J." (January 5, 1973), and a second, "The Wild, the Innocent & the E Street Shuffle" (November 5, 1973) later that same year. Although they were initially compared to the works of an early Bob Dylan, neither album was a commercial success. Later recognized for their lyric brilliance, his songs were too long to receive the radio airplay necessary to promote a record's success. However, Springsteen and his reorganized band of musicians, the E Street Band, developed a loyal following for their hard-driving energy on stage. It was his next album, "Born to Run" (September 1, 1975), that Bruce Sprinsteen to stardom. The album made the top ten and reached number 3. To be his first hit, the title track was an anthem, describing the liberation of youth from the desperation of the young. Each composition was on its own a musical and lyrical masterpiece, capturing the struggles, failures, and triumphs contained within all of us by painting compelling portraits of life using the pallets provided by the experiences of the common man. Dubbed as "the future of rock-and-roll", Springsteen appeared simultaneously on the covers of both TIME and NEWSWEEK magazines for the week of October 27, 1975. He would never be comfortable with this hyperbole. Still, he remained more of a cult figure, as "Born to Run" disappeared off the charts quickly. In the years to come, however, it would eventually find a more permanent place among the other albums voted by various critical assemblies as one of the top ten rock-and-roll album of all time. It would be three years before Bruce would release another album. He became involved in an unfortunate litigation with his first manager, Mike Appel, who tried to gain control of his musical output by preventing him from using Jon Landau as his producer. Bruce was successful in bringing his law suite, and it was settled out of court. "Darkness on the Edge of Town" was released on June 2, 1978, and demonstrated Springsteen's willingness to allow his music to evolve. It was much anticipated and well-received. With it came a sold-out concert tour and a firmly established legion of devout fans. However, it wasn't until his fifth album, "The River" (October 17, 1980), that Springsteen finally scored a top-ten hit with the song "Hungry Heart". The double-album was, to a large degree, a vehicle to release more of the songs he had written and recorded during the prolific period leading up to "Darkness", and that he had played on tour. What followed "The River" was a stunning departure by Springsteen from rock-and-roll with his solo acoustic album, "Nebraska" (September 20, 1982). Using a small Teac 4-track cassette tape recorder, he recorded and mixed the songs in his bedroom while he was living in a farm house in Colt's Neck, NJ. He meant to use this recording as a demo, and brought it into the studio to begin production with the band. After many takes, it was realized that the somber mood essential to the songs of despair had already been captured perfectly on the cassette, and could not be improved upon. It was released as-is. Then, in 1984, came the phenomenon of "Born in the USA" (June 4, 1984). The album turned out to be the biggest seller in the history of Columbia Records, selling 13 million copies. The album turned Springsteen into a symbol of the young American working class. The single, "Dancing in the Dark" won him a Grammy for best rock vocalist. His triumphant concert tour sold out stadiums around the world for two years. The result of this performance marathon was a live album that helped quench the thirst of fans who had been begging Bruce for over a decade to release a live album. In 1986, he finally provided his fans with a replacement for the the hundreds of inferior bootleg concert recordings circulating with "Live/1975-85" (November 4, 1986). In 1987, Bruce moved in new directions in composition and production, replacing his E Street Band with more accomplished studio musicians to record the Grammy-winning album, "Tunnel of Love" (October 6, 1987). E Street Band members still made guest appearances on various tracks, though. The album was filled with songs of fading and broken relationships, and was an obvious reflection of Springsteen's strained marriage and alienation from his first wife, actress/model Julianne Philips. Released as singles, "Brilliant Disguise" and the title track were popular, although haunting. It was a dark time for Bruce. A six-week world rock tour to benefit Amnesty International followed in 1988. It would be more than ten years before the E Street Band would again assemble. In an unorthodox event, Springsteen released two albums simultaneously on March 31, 1992: "Human Touch" and "Lucky Town". Both went platinum, but were met with mixed reviews. In the midst of the following concert tour, Bruce recorded a live special on MTV which was also released as the album "In Concert/MTV Plugged" (September 22, 1992). It included the song "Red Headed Woman" in tribute to his new wife and backup singer, Patti Scialfa. An Academy Award was presented to Springsteen in 1993 for his contribution of the opening theme to the motion picture "Philadelphia", entitled "Streets of Philadelphia". At this point, it seemed as good a time as any to release a "Greatest Hits" (March 18, 1995) album. It sold extremely well and gave his fans as a bonus several previously unreleased songs. Towards the end of 1995, Bruce released an album that captured the somber and the desperate as depicted in the works of John Steinbeck and Woody Guthrie. "The Ghost of Tom Joad" (November 25, 1995) earned Springsteen a Grammy Award for Best Contemporary Folk Album. In the concert tour for this album, he performed an acoustic solo to small intimate venues. Tickets were hard to come by. However, his reunion with the E Street Band in the years to follow allowed many more of his loyal fans to share the experience. "Live in New York City" was released on April 3, 2001. It was a recording of his special concert appearance on HBO. On September 11, 2001, terrorists attacked the United States, killing 3000 people and changing the world forever. On July 30, 2002, Springsteen released "The Rising", an album exploring the loss of lives, the loss of innocence, and the resurrection of hope. It was preceded by an unprecedented advertising and media blitz. The album debuted at number one on the Billboard 200 chart and immediately went platinum. It was nominated for five Grammy Awards, winning three, including Best Rock Album and Best Rock Song, "The Rising". Bruce Springsteen has been one of the most prolific of contemporary musical artists. For every song he has released on a studio album, there are probably ten more written and waiting to be heard. Many of these he has generously given to other artists to record, while others have popped up from time to time in concert. Bruce helped to correct this inequity by releasing an album called "Tracks" (November 10, 1998), in which he includes more than 65 previously unreleased and B-side songs.